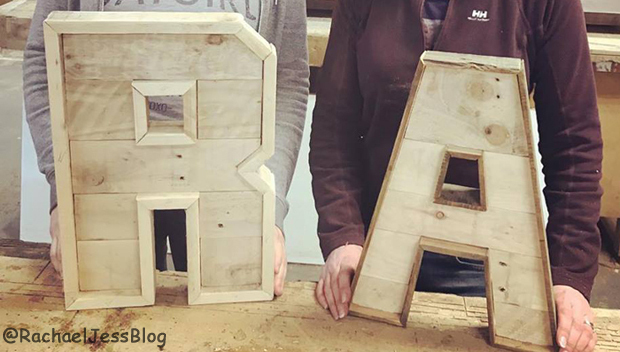 I love to learn, so when a course popped up in my email to learn pallet lettering with the one and only Salvage Sister Charis Williams - I was booked on it before you could say upcycle! 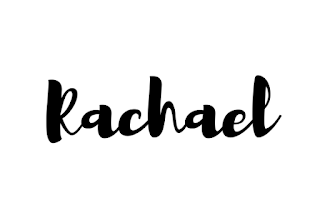 Well, aren't those letterings impressive! And what's more, I made that R! Those who follow my blog will know I do love a pallet project, and up until now, it has been almost complete pallets I've worked with. So to be able to use pieces, cut them up, glue and nail them together again with edging is a whole new ball game. I had a blooming marvellous time! I was rather apprehensive on the day though, I was going by train to an area of Brighton that I didn't know, and I'm a bit prone to getting lost, even with Google maps on my phone! But I found the place OK and was greeted by a very friendly Charis, who has a knack of putting you at ease straight away. We were then joined by three friends, so there was four of us in total for the day's lesson. For this type of course this is the right amount, as we did need Charis's expertise and guidance throughout the day, and I've been on courses before where I've wasted a good half an hour waiting for the teacher to get around to me! 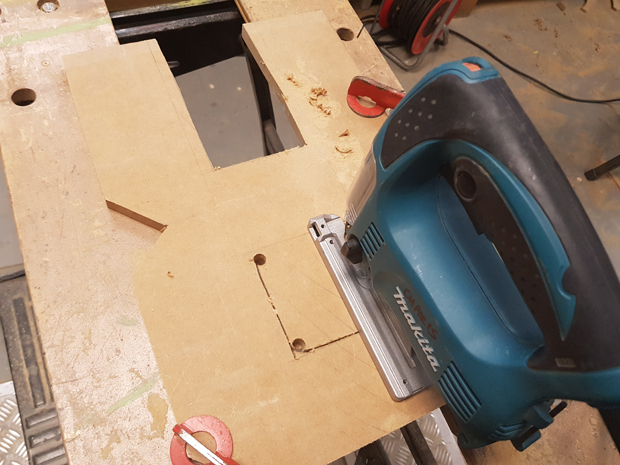 We were taught how to use the circular saw, jigsaw (not my friend that one!) and mitre saw (I think this ended up being my favourite)! We used clamps, glues and a nail gun, and it was great fun - did I say that already? The course runs for 1 day and is from 10.30am to around 4pm. Charis is very relaxed about the timing and will stay and help and guide you until your work-piece is done, and as I had a 'grade 4 for difficulty' piece along with another lady who had an A to work on - we were there until 6pm! 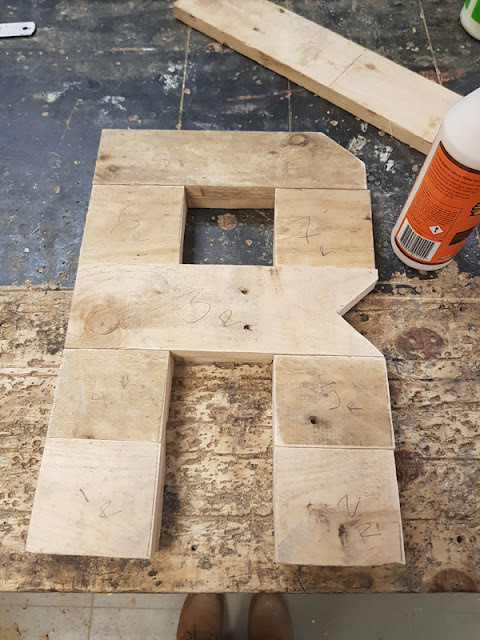 The day went really quickly and I left on a high and the proud owner of my upcycled letter R. Isn't it just the best! 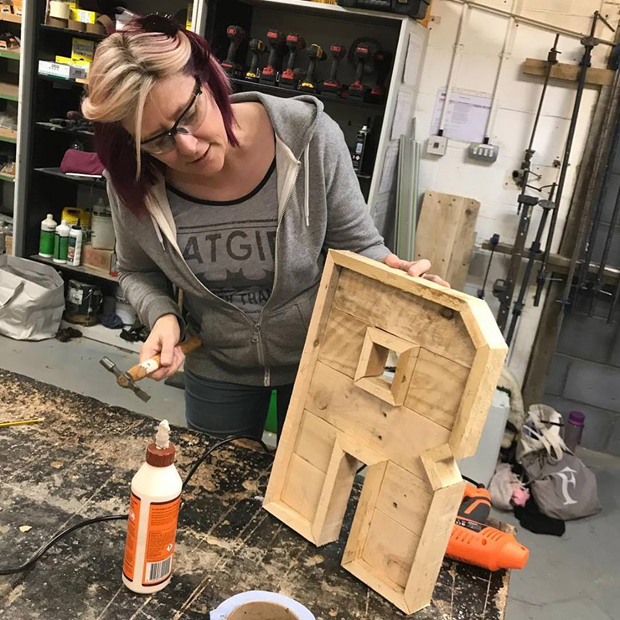 Charis has several workshops running from making lamps from the strangest and best-upcycled pieces to pallet planters and wooden lettering. 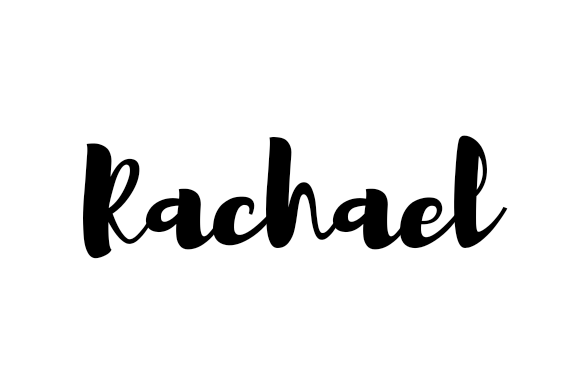 If you are local to Sussex (or even if you're not and fancy a day by the seaside), then I highly recommend giving one of her courses a try, you really won't be disappointed. I do quite fancy the lamp making course!